Fabulous and aesthetic cliff at high altitude, one of the most beautiful in Valtellina, exposed to W / SW and at an altitude of about 2100 meters. Climbing is very technical and resistance on the fingers, with the exception of some more athletic overhang, and takes place on walls of red and black compact serpentine, cut by cracks, mainly vertical or slightly overhanging. The whole area had been discovered and valued by Massimo "Vigneron" Bruseghini, a very strong local climber who unfortunately died in 1999 (a tombstone is dedicated to him in the high sector) that at first had climbed some lines up to 7b pre-protecting himself with friends and nuts and then he bolted and freed all the routes up to the 8th + of "Elever". A new central sector was born in 2002 and was bolted by Gerry Miotti, Gino Notari, Matteo Maternini and Fabio Sertori. 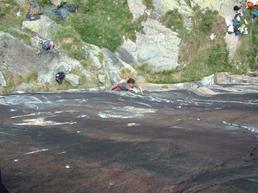 The same have added some new lines in the high crag sector. The crag is recommended for experienced climbers from 6c upwards. The routes are a maximum of 20 meters long, carry a rope of 50 m and 8 referrals. Fixing nail 10 mm, chains with carabiner at stops, names written at the base of the streets. Access: Once in Valmalenco (from Milan to Lecco then Sondrio and therefore well marked the Valmalenco) follow the signs for Campo Franscia go up the former ENEL road to Campo Moro (7 km); after a curve, at the end of the asphalt road, in view of the second dam wall, leave the car in the large square of the Ristoro Poschiavino, under the Zoia Refuge. Walk in a few minutes to the refuge and follow the path for another 5 minutes until you reach the lower sector (on the right of the path). Continuing along the path for a few minutes you pass to the base of the central sector while for the high sector continue until the track passes under the atrapiombi and, turned the corner, a clear reddish wall (10/15 minutes from the parking).